Ebola virus disease (EVD), formerly known as Ebola haemorrhagic fever, is a severe, often fatal illness in humans. The virus is transmitted to people from wild animals and spreads in the human population through human-to-human transmission. The origin of the virus is unknown but fruit bats are considered the likely host of the Ebola virus, based on available evidence. As of 31st October 2014, Guinea, Liberia, and Sierra Leone, are reported as countries with widespread and intense transmission with 13,567 cases and 4,951 deaths reported. Three countries, Nigeria, Spain, and the United States of America are reported as countries with Limited Transmission with 25 cases and 9 deaths. Additionally, Senegal and Mail are Countries with travel-associated cases. The incubation period, or the time interval from infection to onset of symptoms, is from 2 to 21 days. The patient becomes contagious once they begin to show symptoms. They are not contagious during the incubation period. 8. What can I do? Can it be prevented? Currently there is no licensed vaccine for Ebola virus disease. Several vaccines are being tested, but none are available for clinical use right now. Raising awareness of the risk factors and measures people can take to protect themselves are the only ways to reduce illness and deaths. Understand the nature of the disease, how it is transmitted, and how to prevent it from spreading further. Listen to and follow directives issued by Ministry of Health & Medical Services. If you suspect someone close to you or in your community of having Ebola virus disease, encourage and support them in seeking appropriate medical treatment in a care facility. 9. Is it safe to travel? The geographical distance between the affected countries and Fiji, combined with the lack of direct flights and limited incoming travellers, contributes to this low risk. However, preparedness for EVD in Fiji is essential. The risk of infection for travellers is very low since person-to-person transmission results from direct contact with the body fluids or secretions of an infected patient. Fiji and the Pacific have a low risk of transmission. However, individuals should avoid travel to high-risk areas where Ebola is known to be widespread. Travellers should avoid all contact with infected patients. Clinicians caring for travellers returning from affected areas with compatible symptoms are advised to consider the possibility of Ebola virus disease. 10. What about health workers? How do they protect themselves from the high risk of caring for sick patients? Health workers who treat patients with suspected or confirmed illness are at higher risk of infection than other groups. In addition to standard health-care precautions, health workers should strictly apply recommended infection control measures to avoid exposure to infected blood, fluids, or contaminated environments or objects – such as a patient’s soiled linen or used needles. They should use personal protection equipment such as individual gowns, gloves, masks and goggles or face shields. They should use personal protective equipment such as individual gowns, gloves, masks and goggles or face shields. They should not reuse protective equipment or clothing unless they have been properly disinfected. They should change gloves between caring for each patient suspected of having Ebola. Invasive procedures that can expose medical doctors, nurses and others to infection should be carried out under strict, safe conditions. Infected patients should be kept separate from other patients and healthy people, as much as possible. 11. What about rumours that some foods can prevent or treat the infection? WHO strongly recommends that people seek credible health advice about Ebola virus disease from their public health authority. While there is no specific drug against Ebola, the best treatment is intensive supportive treatment provided in the hospital by health workers using strict infection control procedures. The infection can be controlled through recommended protective measures. Fiji’s food and water sources are safe from Ebola. 12. What is being done about the Ebola in Fiji? A Multi-Agency Technical Advisory Group (MATAG) for Ebola was assembled in early August that includes the MoHMS, Ministry of Defense, Ministry of Foreign Affair, Airports Fiji Limited (AFL), FIRCA, Fiji Ports Authority, Ministry of Tourism, etc. and Agencies such as WHO, FHSSP. In order to coordinate a system wide level of preparedness and response to suspected/confirmed case of Ebola Virus Disease, a special Ebola Preparedness and Response Plan has been drafted with Specific Standard Operating procedures completed. 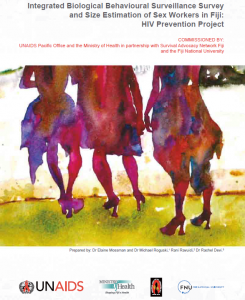 The EVD response plan identifies 3 levels of action advocated by MATAG: Level 1: No potential or confirmed cases of EVD in Fiji. Level 2 Case (s) of imported potential or confirmed EVD (no local transmission; level 3 case(s) of potential or confirmed EVD (associated local transmission in Fiji). Budget Requirements Developed for the 3 Level Responses but a priority budget list for Personal Protective Equipment (PPE) is currently with the Australian Government through the Fiji Health Sector Support Program (FHSSP) for the Level 1 support. To test the efficacy of EVD protocols, the 1st Round Desktop Simulation Exercise was conducted on the 22/10/14 with WHO; the 2nd Round full operation simulation exercise was conducted on 5th November 2014 at Nadi International Airport and Lautoka. Public Awareness on Ebola conducted via Radio Talk shows on 29-11-14 with Assistance Minister for Health (iTaukei and Hindi). 13. What is the Ministry of Health doing to address the Ebola Concerns? Travellers to Ebola affected and at-risk areas should be provided with relevant information on risks, measures to minimize those risks, and advice for managing a potential exposure. Members States should be prepared to facilitate the evacuation and repatriation of nationals who have been exposed to Ebola. The second level of preparedness and control for EVD is at international points of entry, where routine surveillance is heightened. Under normal circumstances, international travelers are required to fill arrival cards. In this case, a special EVD arrival card will be administrated at an International Ports of Entry (POE) to all travellers and they are to indicate whether they have recently visited a country reporting cases of EVD and have any symptoms. Those with positive travel history as well as symptoms will be treated as a case under investigation (suspected case) and isolation protocols will commence. Passengers who have been in an EVD affected country in the past 21 days will be taken aside and asked questions to assess exposure. They will be then given a ‘Conditional Release’ or ‘Conditional Release with Controlled Movements’ and provided with guidance on follow up by health workers. This approach deals with clinical management of suspected and confirmed EVD cases. Here MoH is to ensure the patients suspected or confirmed to have EVD receive proper care while maintaining proper Infection Prevention Control (IPC) procedures and preventing transmission to health care workers. It should be noted controlling infection in health-care settings is paramount as Human-to-human transmission of the Ebola virus is primarily associated with direct or indirect contact with blood and body fluids and transmission to health-care workers is o the most significant. The final level of preparedness is through public health awareness and raising awareness of the EVD within community. In order to coordinate a system wide level of preparedness and response to suspected/confirmed case of Ebola Virus Disease, a special Ebola Preparedness and Response Plan has been drafted. This plan is organized into two phases. The preparedness phase provided is to serve as a guide to all stake holders on the essential actions and activities that must be implemented before there is an alert of a suspected case. The alert phase details four key areas of action during an alert of a suspected/confirmed case i.e. preparedness and control at international points of entry, surveillance and epidemiological investigation, clinical management, and risk communication. 14. Who can I contact for more Information? You can also send your queries to MLO, Ministry of Health 3314088 or 8905053. Increased human risk from communicable disease events (outbreaks) after disasters. Natural disasters such as floods, hurricanes and droughts occur globally every year because of adverse weather conditions or poor land use. Climate change, together with population growth and urbanization as well as travel will increase the number of disasters and change the disease pattern and frequency of disease outbreaks. Most natural disasters result in major communicable disease outbreaks and deaths. These communicable diseases such as dengue fever, typhoid fever leptospirosis are endemic to Fiji while more recent threats occur from emerging communicable diseases such as Zica Virus (Cook Islands, French Polynesia), Chikungunya (New Caledonia, PNG). An understanding of environmental and host factors, transmission pattern and other characteristics of the infectious agent (virus, bacteria) is essential to the control and prevention of these diseases. However Fiji, an understanding of the risk behaviours is also critical to reduce the incidence and devastating mortality associated with these diseases. The term outbreak is used interchangeably with the similar but more technical term ‘epidemic’. However, the latter is preferred as it appears to cause less panic or anxiety. An outbreak or epidemic is defined as the occurrence of cases of an illness with a frequency that is clearly in excess of what is expected in a given area, therefore, demanding emergency control measures. The Republic of Fiji is currently experiencing a national outbreak or epidemic of dengue fever. Dengue fever infections in Fiji occur throughout the year (endemic) but what is unique in this situation, Dengue serotype 3 (DEN3) is an uncommon type of dengue that has not been detected in the region for many years. The outbreak of dengue fever in Fiji outbreak was initialized described as a localized event in Suva and central division but now the incidence of disease has expanded to other parts of the country. There are a few reasons for the increase in incidence and risk of communicable disease outbreaks in Fiji. Firstly, our location as the hub of trade and travel in the South Pacific increases the populations’ vulnerability and risk to new and emerging communicable diseases. Humans that travel are common hosts to spreading these diseases across borders, often unaware of incubating the agent (virus) because they do not display or experiencing any symptoms or signs of disease until reaching their destination. Secondly, trade brings into the country a lot of air and sea traffic that potentially carries breeding places for mosquitoes from a foreign country. In addition, the other important factor is related to a changing environment commonly referred to as an impact climate change or extreme weather condition that precipitate frequent occurrence of natural disasters. There is sufficient evidence to show that climatic conditions increase the risk of communicable disease events such as outbreaks in the region. During natural disasters, Pacific island countries are commonly affected because of unprotected exposures to the elements, poor housing structures, lack of proper utilities related to poverty or access and an element of inadequate disaster preparedness efforts due possibly either to ignorance or laissez-faire attitude. The impact of communicable diseases may occur immediately after the disaster but most generally occur weeks after the event due to displacement, disruption of utilities and access to health services, and limited choice in food supply and limited access to basic needs. Communicable diseases that commonly increase after floods in Fiji are diarrhoeal diseases, leptospirosis, dengue fever and typhoid fever. The most common diseases with the highest recorded fatalities are leptospirosis, which presents similar and often mistaken for the severe haemorrhagictypre of Dengue fever. 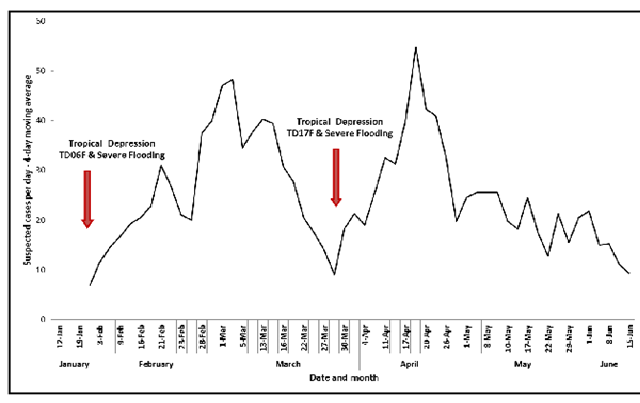 In figure 1, there was a significant increase in cases of Leptospirosis at flood prone areas in Fiji, at least 5-8 weeks after a flooding event. There were approximately 300 cases with 25 deaths following floods in 2012. One of the high risk behaviours associated with this disease in Fiji and commonly seen live television, is wading through infected waters. Unknown to the individual is that animal urine in flooded waters in a very small dose entering through the cornea of the eye is sufficient to cause an infection. Dengue fever on the other hand is not directly associated with flood because all the containers are washed away (but not destroyed). A dengue fever outbreak may occur when mosquitoes begin breeding again in ideal conditions (man-made containers) after a flood which usually is at least 6 weeks after a flooding event. Transmission of the virus by young mosquitoes can be further exacerbated by disruption of basic water supply and poor sanitation. There are certain risk behaviours such as increased exposure to mosquitoes while socializing outside, wearing minimal clothing due to humidity, movement of infected persons to another area and changes to the environment. Further spread of neglected diseases e.g. Leprosy, etc. High morbidity and mortality from delayed epidemic detection and response e.g. dysentery, meningitis. Emergence of a few ‘super bugs’ which are resistant to all antibiotics. They were limited to hospitals previously, but are now circulating in communities. It never ends with the list of communicable diseases that increase after natural disasters and extreme weather conditions which benefit the proliferation of the vectors (mosquitoes) due largely to the risk bhaviours of humans. The greatest challenge with these diseases after a natural disaster is the common clinical presentation that is indistinct from others. Although caused by different agents, they often require a different treatment regime for infected individuals. For example; Dengue fever is similar in presentation to Leptospirosis but is a virus infection with no specific treatment while the latter is only effectively treated with antibiotics early in the disease course. It is often uncommon to have patients presenting to the clinic with one disease and sent home to return with another, especially when there are no diagnostic laboratory tests with 100% accuracy to detect either disease. Commonly, a subjective decision is made based on severity of presentation. This emphasizes the importance of prevention at the individual level on avoidance of floodwaters and reduction of man-made containers that breed mosquitoes. The individual level motivation must occur before any successful engagement of the community. Mass communication done proactively has an important in educating the public to adopt protective behavior and in reducing the risks to the individual, family and community.